Want to compare the cost of taxis, limos, Uber, Lyft and others while on the go? Wish there was one app that could hail any taxi or rideshare for you? Check out the new RideGuru iPhone app, the search engine for all rideshares. The RideGuru iPhone and iPad application compares rideshare and taxi rates across hundreds of services (Uber, Lyft, Ola, Didi Kauidi, Fasten, traditional taxis, limo networks, etc) in thousands of cities worldwide to bring you the best deals no matter where you are traveling. Not only does RideGuru save you money, it also saves travelers time by allowing users to quickly filter their results to find a car that fits their specifications. Once the perfect ride has been found, simply hail or dispatch your desired ride straight from the RideGuru app. If you plan on using rideshares or taxis during your upcoming travels, download RideGuru and travel with confidence! To learn more about the RideGuru mobile app click here. To view the Press Release please click here. To view a Text Only Press Release please see below. Calling all travelers! This innovative rideshare search engine saves you time, money, and energy. RideGuru, the rideshare comparison app, is now available for iPhone and iPad users. Powered by the popular travel website, RideGuru, the RideGuru mobile app is a search engine for rideshares and other on-demand ground transportation services. Users can compare costs of various rideshares and taxi services worldwide, then hail their desired car straight from the app. Since RideGuru’s release in September 2016, the site has stood out as the aggregator of taxis, limos, and rideshares. 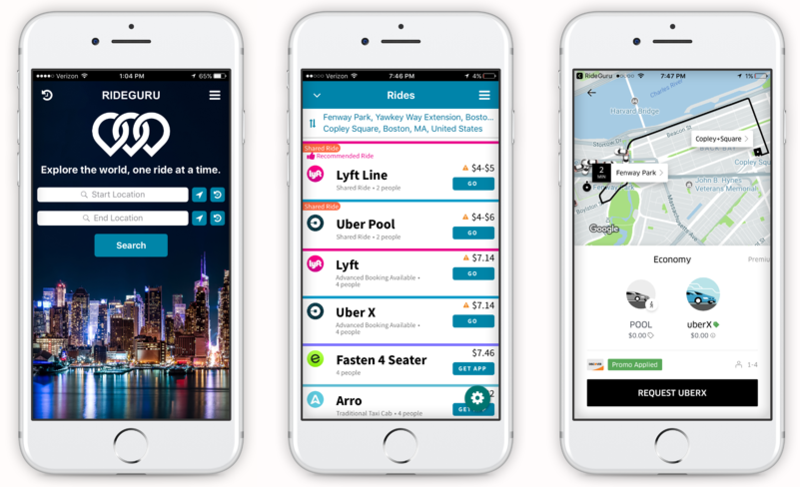 Not only does RideGuru compare large on-demand car services such as Uber and Lyft, it also scours rates from hundreds of smaller services to bring the user an array of travel options. Through its vast support of all rideshare, taxi, and limo companies worldwide, users will feel secure in finding a local ride even if their destination is off the beaten track. The RideGuru app supports more than 100 rideshare services from companies such as Uber, Lyft, Juno, Grab, Curb, Fasten, Wingz, and Zum. Users can filter the choices, by entering number of passengers, car type, accommodations, and other specialty features, such as rideshares for women and children or “shared rides” like UberPool and Lyft Line. Once users have made their selection, they can dispatch the ride from Uber or Lyft directly, with similar dispatch support coming soon for other rideshare companies. RideGuru is known to be the most robust rideshare comparison tool in the world. To learn more about RideGuru’s groundbreaking fare comparison technology visit RideGuru. RideGuru, a product of Unleashed, LLC, is an all-inclusive rideshare and taxi information source. RideGuru is not another transportation service, instead, it is a search engine to help you find the best ride from point A to point B. It scours rates from hundreds of services worldwide to bring you the best deals. Unleashed, LLC is a Boston-based technology company that specializes in creating websites and smartphone applications to provide users with the information they need for daily decisions. The company is best known for creating the popular travel site TaxiFareFinder.com. TaxiFareFinder, released in 2007, is an online resource for all things related to taxis and rideshares. TaxiFareFinder is best recognized for its groundbreaking, location based, taxi and rideshare fare calculators. Welcome to the TFF Newsroom! Welcome to our Newsroom & Blog page. Thanks to your support, TaxiFareFinder.com (TFF) and our new RideGuru Comparison Tool are now trusted sources for millions of taxi and rideshare users across the globe. As our community continues to grow, we wanted an effective way to communicate and share information with both riders and drivers in this industry. Enjoy and Happy Traveling! Stay up to date on the hottest news stories in the taxi and rideshare industries. Plus we love to host contests and share fun facts with everyone who signs up! You can change your mind at any time by clicking the unsubscribe link in the footer of any email you receive from us, or by contacting us at [email protected].Guru. We will treat your information with respect. For more information about our privacy practices please visit our website. By clicking below, you agree that we may process your information in accordance with these terms. Do You Tip Your Uber Driver?